The adult beetles have black, slightly elongated body with convergent white stripes and white margins behind the head. The beetles of this species are 4-7 mm in size and have usually 12 black spots on the red or orange forewings. The larva is long with a waxy blue and orange coloration, alligator-like, and a very aggressive predator. They are usually 7-8 mm in length and have three pairs of prominent legs. Eggs are small, spindle shaped, and are laid near the food source in batches of 15-30 eggs. These beetles can adjust their life cycle according to the availability of aphids. One to two generations occur each year, depending on the length of the season, before the adults enter winter hibernation, usually in a protected site. 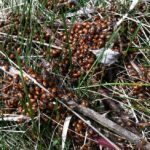 In the western United States, adult beetles typically migrate to mountain canyons or foothills and spend up to nine months (from May to February), hibernating in large aggregations far from potential food sources. In the very early spring, the adults disperse in search of prey and suitable egg laying sites. Females can lay from 200-300 to more than 1,000 eggs over several months during spring or early summer. The number of eggs female lays will depend upon the availability of prey. Eggs are usually deposited near prey such as aphids, often in small clusters in protected sites on leaves and stems. The first larvae that hatch will start eating the unhatched eggs which will provide energy for the larvae before they find any aphids. Development from egg to adult may take only two to three weeks, and adults live for weeks or months, depending on the location, availability of prey, and time of year. Overwintering adults may be less susceptible to recommended application rates of some pesticides than active adults and larvae. However, minimization of the use of broad-spectrum insecticides is highly recommended for the conservation of these predators, providing them refuges. Balduf, W. V. (1935). The Bionomics of Entomophagous Coleoptera. St. Louis, MO: John S. Swift Co. Beers, E.H., Brunner, J.F., Willett, M.J., and Warner, G.M. (1993) Orchard Pest Management: A Resource Book for the Pacific Northwest. Good Fruit Grower, Yakima, WA. 276 pp. Hagen, Kenneth S. (1960). 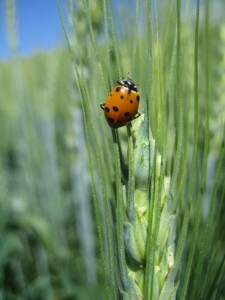 “Biological Control with Lady Beetles”. Plants and Gardens: the Brooklyn Botanic Garden Record 16 (3): 28–35. Haug, G. W. (1938). “Rearing the Coccinellid Hippodamia convergens on Frozen Aphids”. Annals of the Entomological Society of America31 (2): 240–248.